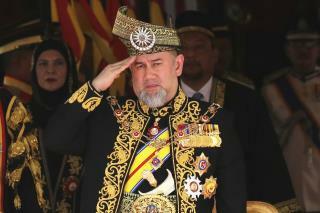 (Newser) – Malaysian King Sultan Muhammad V abdicated on Sunday in an unexpected move, reports the AP, after just two years on the throne. The palace said in a statement that the 49-year-old ruler had resigned as Malaysia's 15th king with immediate effect, cutting short his five-year term. No reason was given in the statement. It marked the first abdication in the nation's history. Sultan Muhammad V, ruler of northeast Kelantan state, took his oath of office in December 2016, becoming one of Malaysia's youngest constitutional monarchs. He is said to have married a 25-year-old former Russian beauty queen in November while on a two-month medical leave. Reports in Russian and British media and on social media featured pictures of the wedding, which reportedly took place in Moscow. Neither the sultan, the palace, nor the government had officially confirmed the wedding. Speculation that Sultan Muhammad V would step down emerged this past week, shortly after he returned from his leave, but Prime Minister Mahathir Mohamad said Friday that he was unaware of any abdication plans. Under a unique system maintained since Malaysia's independence from Britain in 1957, nine hereditary state rulers take turns as the country's king for five-year terms. The monarch's role is largely ceremonial, since administrative power is vested in the prime minister and parliament. But the monarch is highly regarded, particularly among the ethnic Malay Muslim majority, as the supreme upholder of Malay tradition. Man Russian girls must learn like 20+ languages early in life. So, he resigned from the official position as tradition place holder.